The Lord-Lieutenant of Kent taking the salute after laying a wreath by the unveiled paver to Major Dougall VC MC. (c) David Bartholemew. 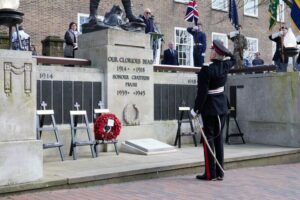 This Ceremony was held to unveil a special paver near the Tunbridge Wells War Memorial in memory of Major Eric Stuart Dougall VC MC , Royal Field Artillery, who was born in Tunbridge Wells 13th April 1886, and died 14th April 1918 at Kemmel in Belgium. Major Eric Stuart Dougall won his VC when he was 31 years old, and an Acting Captain in the Special Reserve, Royal Field Artillery, attached to A Bty., 88th Brigade. 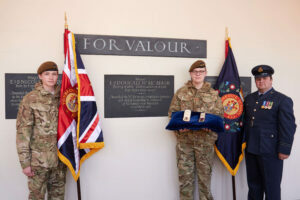 Medals for Major Eric Dougall VC MC being displayed by cadets from Tonbridge school acting as guardians of the medals. (c) David Bartholemew. He was awarded the Victoria Cross for his deeds on 10 April 1918 at Messines, Belgium, for most conspicuous bravery and skilful leadership in the field when in command of his battery. The Lord-Lieutenant was in attendance at the ceremony to unveil the paver and to lay a wreath at the commemorative event. 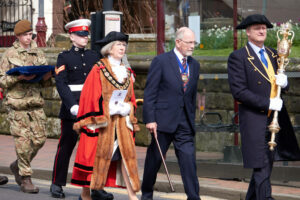 The Mayor of Tunbridge Wells, Cllr Julia Soyke, being escorted to the War Memorial. (c) David Bartholemew.